Hot. That's what it feels like here in Chicago. Unseasonably hot. It seems as though we've only got two seasons, fall and summer. I think Chicago is in need of learning how to compromise. With the temperatures easily reaching upper 90s, if not higher with the heat index, everyone is looking for ways to stay cool. At our house, I've been making countless batches of this Fresh Herbed Lemonade because it's not only good but one of the most refreshing drinks I know of. Sweetened lemonade is heightened by the freshness of fragrant herbs with every sip! 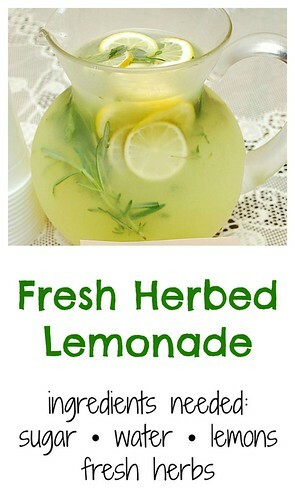 I never would have thought about adding fresh herbs to lemonade. This idea was shared during the recent National Restaurant Association convention I attended a few weeks ago. The longer the herbs sit in the lemonade, the better. So making this lemonade a day ahead would be ideal. Essentially, fresh herbs of your choice is muddled in freshly squeezed lemon juice and thin lemon slices to bring out the natural oils of the herbs. Aside from adding herbs, some other things you can add include edible flowers and stalks of lemongrass (bruised). A simple syrup made with water and sugar is added to sweeten and water rounds it out. Juice 8-12 lemons to yield about 1 1/2 cups of fresh squeezed lemon juice. Place in a serving pitcher along with 2 additional lemons that have been thinly sliced. Add your choice of fresh herbs and muddle to break out the herbs essential oils. Add the chilled chilled syrup and remaining 7 cups water. Cover the top of the pitcher with plastic wrap and chill overnight for the herbs flavors to come through. Serve cold over ice. 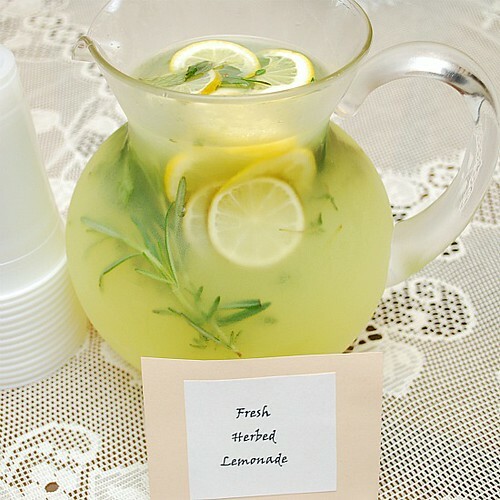 I absolutely adore herbed lemonades, especially with a splash of sparkling water. Basil and rosemary are my two favorites!